Ready for another installment of Die Ugly Toys, Die! - spotlighting great DIY in the epic battle against ugly? 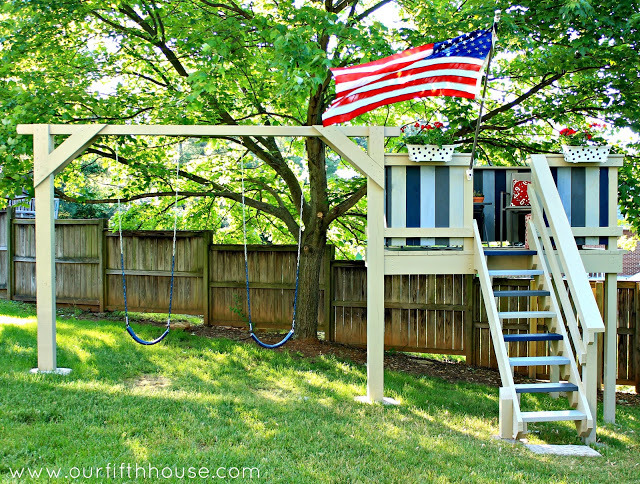 Check out this great DIY swingset + clubhouse from Our Fifth House. What child would not love this? Carmel and her Dad did such a great job - its classic styling and little decorative touches make it clear this whole project was done with love. Pop over to Our Fifth House to get all the details on how they did it. Want more inspiration? Check back every Thursday for a new installment. I have lots of other great #dieuglytoysdie projects to share with you for this summer series - I hope you love them as much as I do. Want your project to be featured? Drop me a line. It is amazing how just the paint made the swing set look so special and unique! Our DIY swing is one swing, like these, hung from our huge century oak with views of pastures, meadows & lake. there's nothing like swinging high into a huge old tree in any season. It's been swinging children for almost 20 yrs now.